Last saturday night. There were a saturday night’s youth gathering program. 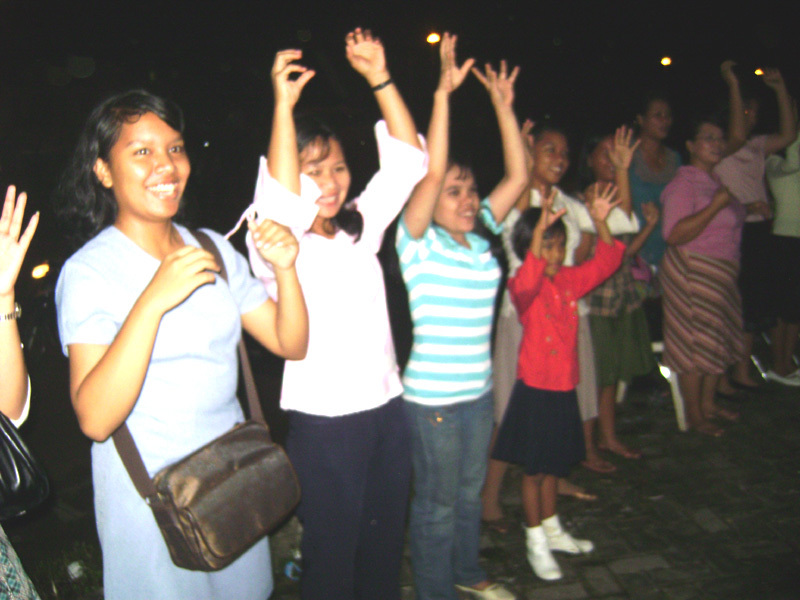 The youth from our churches and some churches nearby gathered with the youth from Tangerang’s area. The occassion held in a church in Palem Semi. Well, while watching them, take some pictures of them, there are two things hit my mind. First, indeed… I am old! Haha! Second, the memory of the past come again like a tsunami wave and took away all excitement I might have that night. I always hate this kindda time. I was like those youth. So young and might bit naive (though naive is kind a difficult word to apply to me.. :)). Not likely they who enjoy and laugh on the games, I never had that much fun before. I was shy (and still is…I think…though some friends will laugh at me if I rely it to them) and full of thought that I am not pretty, not attractive, not chic or whatever quality that will make man interested in a woman. So, on that kind of youth occassion, I mostly draw myself alone. I prefer to be under the shadow, pretend that I am not interested. I remember most of the time, to avoid kind of sick feeling and embarrasment. I choose to left before the marching-dance time. Never anybody asked me to dance, so I choose to run! I was too much sensitively think of myself other than just take a fun of it, think well and just choose pick any of my friend or ever a boy that I like to dance with me! So, saturday night was not my favorite time neither any youth gathering.